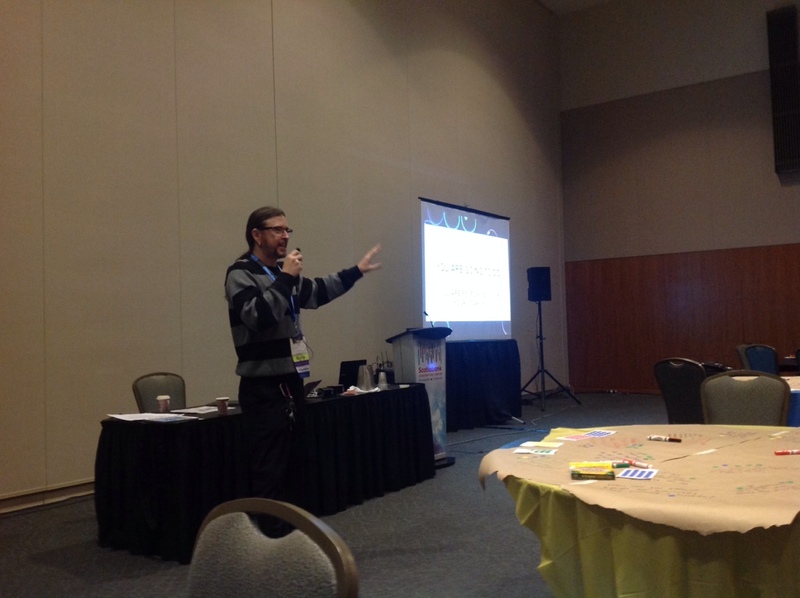 Recently, this past October, I presented at ECOO 2013 in Niagara Falls, ON. I presented with Lisa Neale (@lisaneale), principal of Ancaster Senior in Ancaster, and our topic was Professional Learning and Expression. During the preparation process for the Grade 8 Student Voice Forum to support students with their upcoming transition to Grade 9 at Ancaster High, Lisa and I planned a 1/2 day of professional learning for her staff that would not only provide them with a meaningful rationale and context for their learning (to support the student voice forum) but would honour their individual interests and learning preferences. Overall, I (personally) have found professional learning opportunities to be profoundly boring and insulting – not only to my intelligence but to my expertise and learning preference. More than once a month I find myself at a meeting where I know the majority of what we are discussing and can likely deliver it myself. Why then, I ask, am I expected to sit there? Why can I not choose to participate my own way? Am I not a professional? Can I not be trusted? Do I need to be seen to prove I’ve learned? Does that even make sense? We talk so much of differentiating learning for our students, moving away from sit and get, exploring the world of inquiry based learning, and redefining the role of teacher as facilitator and activator of learning (Michael Fullan – Students and Teachers as Learning Partners) rather than the expert and master of all. Despite this, however, I find that in-services, meetings, and workshops for staff continue to be largely sit-and-get / compliance type endeavours where someone talks and talks about what we could or should be doing. I believe that voice (student, parent, and teacher) is absolutely vital to ensure that learning for all is relevant, contextual, meaningful, and personal. We asked our participants what they wondered about when considering professional learning and to document that thinking on our “graffiti tables”, podcast, and blog. Traditionally, this type of brainstorming is lost to the geographical and temporal environment of the workshop or meeting. By taking pictures of the brainstorming and placing them here on a blog those questions and wonders are augmented beyond the physical to digital space where questions can continue to be asked or responses given to the questions and wonders of the time (think of the A in the SAMR model – Augmentation with a functional improvement = collaboration). We also showed them Mobile Podcaster (an iOS podcasting app that posts directly to a WordPress blog) and how it can be used to capture oral expression and/or conversation. These recordings can also be uploaded to this space to be continually heard, reflected upon, and responded to. Ultimately, we provided for teachers the same choice of expression as I have offered the students at our student voice forums. These opportunities to share through indiviudalized mediums and tools of choice empowers the learner to explore the inquiry their way, thus increasing engagement and motivation to participate. Watch this clip of Steven Katz where he talks about what counts as professional learning…. …now have a look to see the diversity of opinion of what our participants shared. I have found that I am not alone. These are authentic considerations to the question, “What do you wonder about professional learning?” *NOTE: the coloured stickers next to the comments reflect the following: green=agree, yellow=on the fence, red=disagree, blue=really good thought / idea. I ask you to reply to this post with the same. Let’s keep the conversation going….What do you wonder about professional learning? What do you wonder about professional learning? Reading the thoughts of others. Using coloured stickers to rank answers. Lisa Neale starts the session. Participating in the Learninghood on the sandbox site. I wonder how much the traditional hierarchical structure in education ( with the Ministry at the top ) will allow for inquiry based professional learning? The difficulty may lie in those at the top feeling a loss of control over learning outcomes, similar to what teachers sometimes fear in classrooms when they first step into inquiry based learning. I wonder how many disgruntled teachers would embrace professIonal learning if they were allowed to learn about something meaningful to them?